May Day, or vappu in Finnish, is the highlight of the student spring in Turku. The day before students and other residents of the city gather together to put on their student caps. Photograph from vappu of 2018. Turku is an excellent city for students, a new study claims. The level of satisfaction brings to mind election results under dictatorships. 99 % recommend Turku for a friend as a city to study in. 98 % think Turku is a student-friendly city. 97 % think Turku is good place to reside and live in. 96 % find Turku to be a beautiful city. Last spring the Study in Turku -network asked students in the city’s six higher education institutions how they enjoy living in Turku. Over 2 100 students answered the survey, 30 percent of whom were students in the University of Turku (UTU). The results are excellent. Special thanks go to the city’s size, active student culture, the ease of movement around the city as well as Turku’s beauty and coziness. Or as the study summarizes: “Turku is a compact and lively student city with equal parts of action and tranquility”. As a student city Turku gets a school grade of A- from the poll’s respondents. Although Turku is commended in the report, points for improvement remain. For example, students hope for better cycleways and more frequent bus connections at night. Marketing is in need of some brushing up as well: only a bit over half of the respondents are aware of the student benefits offered by the City of Turku. 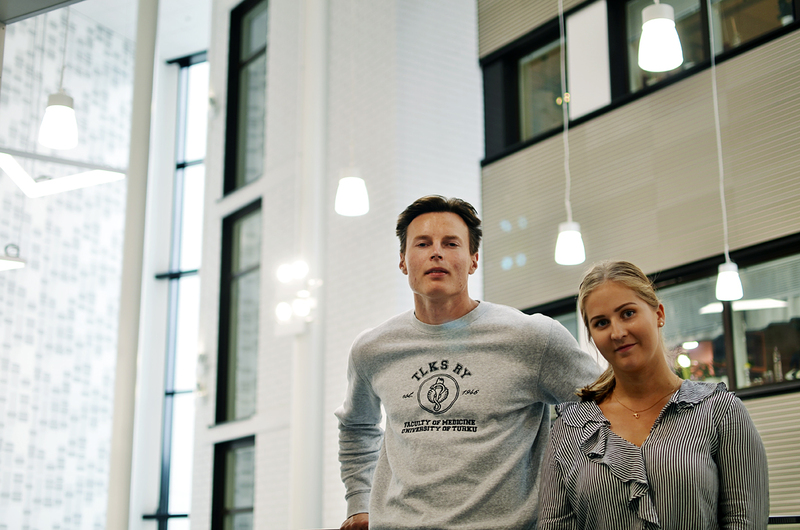 Students at the Faculty of Medicine in the UTU, Noora Ikonen and Aleksanteri Seppänen, are satisfied with Turku as a student city. Praise goes first and foremost to the size of the city: everything is within a fair distance, including the different campus buildings and student restaurants. “The Faculty of Medicine is a bit separated from all the other campus buildings, but that’s not really a problem”, Seppänen says. Ikonen’s experience of Turku is reflected through her home town, Helsinki. Traveling inside Turku is faster and apartment prices are distinctly lower compared to the capital city. For instance, Ikonen doesn’t need to use public transport at all since she lives in the city center. “There could be more cycleways as they are strangely cut off here and there”, Ikonen thinks. Medical students Aleksanteri Seppänen and Noora Ikonen are happy with the extent to which local businesses offer student discounts in Turku. Instead of obvious shortcomings, Ikonen and Seppänen hope for certain additions to everyday life. It would be convenient to have the alcohol retailer Alko on Hämeenkatu and a McDonald’s in the city center. Also, one of the student restaurants should have longer opening hours, as an alternative to Assarin Ullakko. “Cheaper coffee wouldn’t hurt, of course. In the Turku School of Economics a cup costs 20 cents whereas here it’s 1.50 euros”, Seppänen laughs. There are over 39 000 students of higher education in Turku, making nearly one in five city residents a student. Approximately 5 000 new students begin their studies in Turku each fall. In total, the city’s six higher education institutions offer more than 170 different degree alternatives. The City of Turku aims to make Turku the best student city in Finland.